The Delaware Division of Libraries and Delaware public libraries invite children, teens, and adults to join the 2016 Library Summer Challenge! 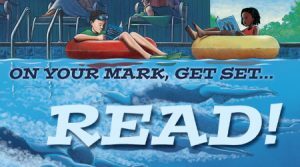 Themes for this year revolve around physical activities, “On Your Mark, Get Set…Read” for kids, “Get in the Game, Read” for teens, and “Exercise Your Mind. Read!” for adults. Registration is free at all public libraries and incentive prizes are awarded based on reading and activity milestones. A Healthy Portion of Science is how the Delaware Aerospace Education Foundation will lead children through science, math, and engineering on the way to good health. You and your child will be introduced to the food groups and what we can learn from food packaging labels. Take a walk through the digestive system, learn how to find your pulse and count its rate, and see how the muscles and bones of the legs enable movement. Use food labels to practice math skills like classifying, counting, comparing numbers on a number line, and mental math. Do the work of an engineer as you model the organs that aid digestion and circulate your blood. On your mark, get science, and go healthy! The Delaware Nature Society, in conjunction with Abbott’s Mill and Ashland Nature Centers will present a variety of nature-related programs at public libraries throughout the summer and fall. The Delaware Division of Libraries, a state agency dedicated to unleashing the potential in all Delawareans in partnership with Delaware Libraries, offers free access to the online catalog (delawarelibraries.org); Wi-Fi; computers/internet; eBooks, programs/workshops, community partnerships, and more.